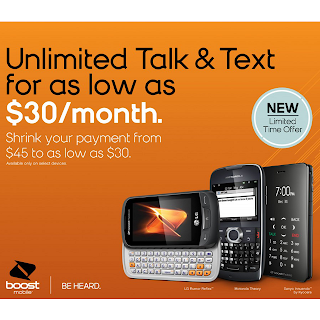 Boost Mobile is dropping its $45/month Talk & Text Unlimited Plan . The plan, which doesn't include data and is only available on feature phones (non-smartphones), was launched as a limited time promotion on March 29, 2012. The promotion is ending June 12, 2013. Current $45 Plan users and anyone who activates the plan before June 12 is grandfathered and can stay on the $45 plan indefinitely as long as they don't switch to an incompatible device or switch plans. 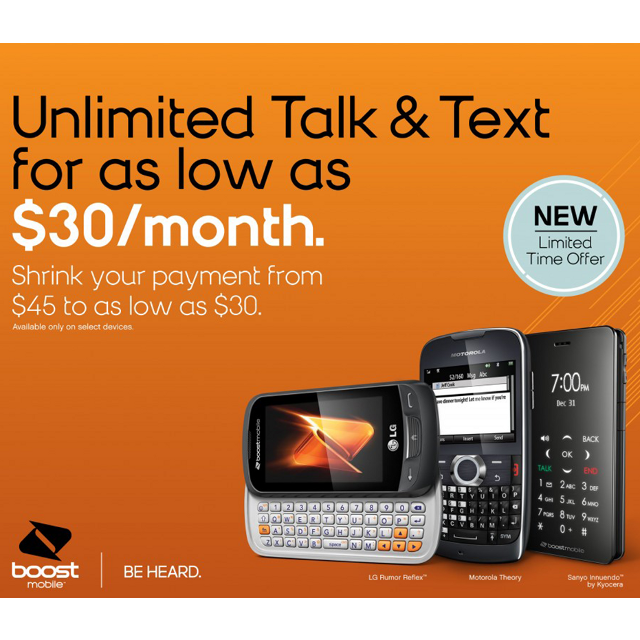 After June 12 the least expensive monthly plan available to new feature phone users will be the $50 Monthly Unlimited Plan, which includes unlimited talk, text and data. The $45 plan is a good deal for heavy users of voice and messaging services who don't want data or a smartphone. It comes with Shrinkage, Boost's loyalty credit that reduces monthly payments by $5 for every six on time payments. The maximum Shrinkage reduction is $15, so after 18 one time payments the plan price is only $30/month. Boost's similar $45 plan for BlackBerrys is apparently not going away. It also includes Unlimited Talk and Messaging plus unlimited BlackBerry Messenger. Data over the mobile network is not included but Boost's BlackBerry Curve 9310 does have WiFi which can be used for Web and email access. Personally, I'd take a BlackBerry over any of Boost's feature phones, especially now that choosing the BB provide a $5/month savings compared with a feature phone for new users after June 12. 0 comments to "Boost Mobile Discontinuing $45 Unlimited Talk and Text Plan"